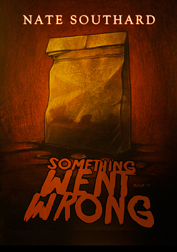 Something Went Wrong now available! My second fiction collection, Something Went Wrong, is now available for purchase from Thunderstorm Books!Â Limited to 100 copies, this signed collector’s edition contains reprints of some of my favorite stories from the past five years and some great new stuff, including the title novella, which might be my best work to date. With wood and nails, a man builds a weapon of hatred and violence in order to battle his past…. In the middle of the night, a lonely man wakes to find a sack of body parts on his doorstep…. A mysterious agent wonders if he can live with his new job while training under a man who horrifies him…. Terror and true love. Determination and hatred. Sadness and hope. All this and more awaits you in Nate Southard’s second collection of short tales. Including the original novella Something Went Wrong, these seventeen stories of broken, angry, mournful, and iron-willed people will show you the lengths the desperate and lonely will go to when the stakes are high and things go wrong.